Please scroll to the bottom of this page to see our UPCOMING LITTERS. Our goal at Willow Lane Labradoodles is to breed top class Multi-Generational Australian Labradoodles with amazing qualities. We want to be known for the consistent traits in what we breed and for the love and care we put into each and every litter. That is why we breed on an extremely small scale. Every litter is raised in our family room and sleep in our kitchen until they leave us at 8 weeks old. All our pups are raised with the Puppy Culture program! From day 3 of their lives we follow a program that progresses at the rate the individual pup does and when they are ready to move on we do. It aims to give each puppy the best chance at coping with the big wide world. They all still have their own little personalities of course, some will be more timid or shy, some will be confident or bold but Puppy Culture aims to help prepare them for life. You can read about the Puppy Culture Program or purchase their resources by clicking on the Puppy Culture banner. You can also join their Facebook group and chat to others about Puppy Culture! All the breeding dogs we use at Willow Lane, whether it's our girls or 'hired studs', are fully health tested. What does this mean? For some breeders (unfortunately) this means the vet has looked over the dog, or perhaps they have tested the hips of one parent. So it's always worth asking what testing the parents have had and request to see results if you feel the need. Elbows & Hips - we use two methods of hip testing to ensure we are getting a full picture of hip health. AVA and Pennhip testing is completed on all our dogs and we use this to help ensure we are doing our best to keep improving the quality of our offsprings hips. This said, it is important to note that hip dysplasia is the result of both environmental and physiological factors and not just genes, so it's important to be mindful of how you allow your treasured friend to run and jump throughout it's early life, as well as ensuring the dog isn't carrying excess weight. DNA Testing - an example of DNA testing results are below. Occassionally the 'full breed profile' (currently 19 disease tests and numerous trait tests) changes and will incorporate a new test or remove an old one that is now seen to be obselete. If a dog is a carrier of something, it is not instantly disregarded from our program. Many carriers are vital to use within the program as they carry other fabulous traits. It's just important to ensure that carriers are bred with clear dogs as this ensure the offspring can not be effected with any of the diseases. If you wish to chat about any tests or see any results of any of our dogs, please don't hestitate to ask. 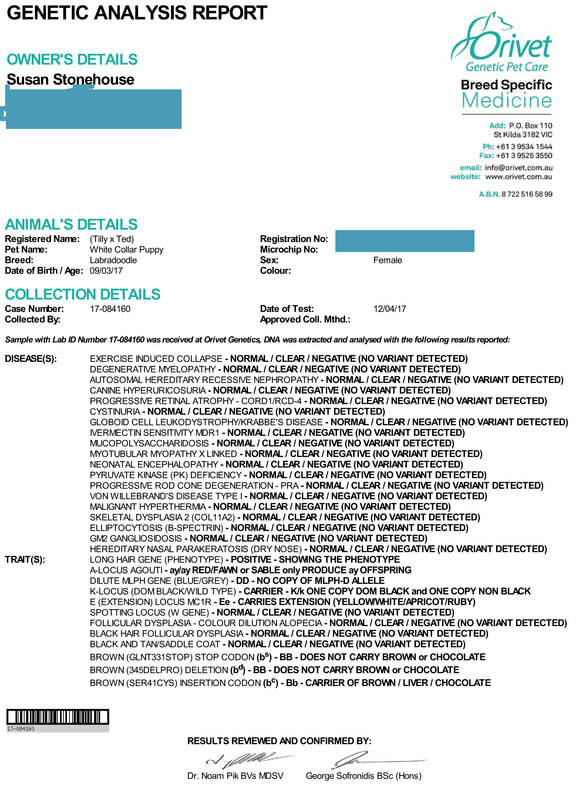 Other considerations - Health testing results are just one component that we look at when selecting a breeding dog. Confirmation is assessed against the breed standard as described on the ALA page and the temperament of each pup is considered. We are looking for an overall 'quality' dog, not one with just great hips, or great coat etc, but a well rounded dog with good results across the board. We are hopeful of a medium litter of gorgeous fleece coated pups from Willow (Willow Lane Leading Lady) around the middle of this year. It will be her first litter and given her fabulous temperament and stunning good looks, we are very excited to see what traits she passes onto her pups. Stay tuned for more information or follow our facebook page for updates on matings and pregnancy announcements.